Well, I'm ready for Halloween, how about you? Just kidding. I'm not carving my pumpkins just yet. 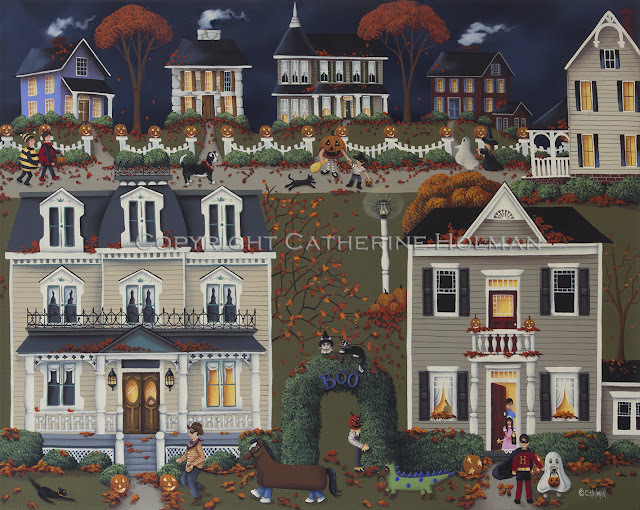 This painting was such a delight to paint from the two girls dressed as a lady bug and bumble bee to the cats perched on top of the arched hedge between the two lower houses. I adapted this painting from a smaller one I had done years ago and just kept adding and adding. I will put this painting on eBay when we get a little closer to fall. Echoes of trick or treat resound through the night as costumed children squeal with delight! It came out very well...no less than I would have imagined!